When learning Android app development, one of the most important topics to understand is how to create delightful mobile interfaces and interactions. This means understanding the conventions within the Android universe, common style guidelines, patterns, etc. The official Android docs has an excellent set of design resources. This section will highlight a few key design guidelines and link to the appropriate guides. You can also check out these Android design tips for a quick overview. Check out these design principles which were developed by and for the Android User Experience Team to keep users' best interests in mind. Consider them as you apply your own creativity and design thinking. Deviate with purpose. Using these materials, you can understand and begin adhering to these guidelines for your own applications. As you plan your app for Android, keep in mind that different platforms play by different rules and conventions. Design decisions that make perfect sense on one platform will look and feel misplaced in the context of a different platform. If you have built web and/or mobile apps in the past, review this Pure Android Guide for look at how to avoid making Android design faux pas. Check this article from jackrabbit for a more detailed breakdown. Check out the UI Overview page which provides a high-level tour of key UI element. In particular, check out the Common App UI which outlines the key UI elements including the Action Bar, Navigation Drawer and Content Area. For material design, check out the Material Palette for color selection. Check out the typography guide to understand the common font types for Android apps and default type colors and sizes. See the calligraphy library for each custom fonts. An icon is any graphic that takes up a small portion of screen real estate and provides a quick, intuitive representation of an action, a status, or an app. Icons must be created to work across a wide array of devices. There are also many different types of icons such as the "Launcher" icon on the home screen, ActionBar icons, and notification icons. To get started with icons, check out the material icons style guide. If you are looking for actual icons to use, check out materialdesignicons.com and material.io icons. Check out the iconography guide and icon design guidelines for a detailed look. In particular, work to understand the design tips and follow the correct naming conventions for different icons. Overall App Structure - High-level guidelines for the elements of an app. Gestures UX - Gestures allow users to interact with your app by manipulating the screen objects you provide. Swiping Views - Efficient navigation is one of the cornerstones of a well-designed app. Navigation Drawer - The navigation drawer is a panel that transitions in from the left edge of the screen and displays the app’s main navigation options. Notifications UI - Allows your app to keep the user informed about events, such as new chat messages or a calendar event. Following these and related guides explains in detail how to create consistent and delightful mobile apps. UI-Oh-My - Great resource for seeing screenshots of apps. androidpatterns - UI patterns organized by questions, such as "How can I let users manage their accounts?" Using these sites above to build up an intuitive understanding of how to build different UIs in your apps. When developing a mobile application, there are a few stages you will probably go through during an agile development method. First, you decide on the core value of the app and determine the key user scenarios. From there, it is helpful to begin identifying and sketching the different distinct user interfaces and user interactions for the app. 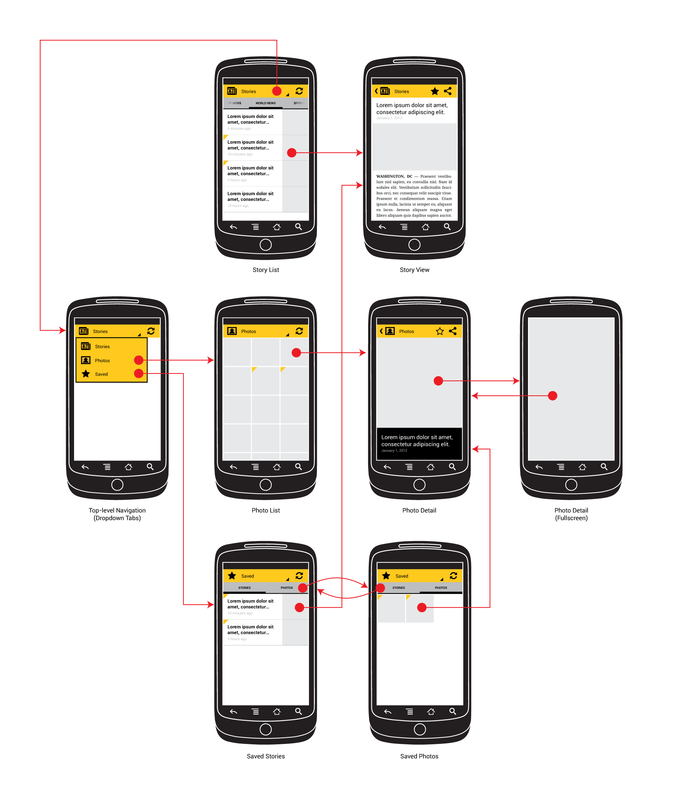 See the android docs on wireframing for additional perspective and examples. Created by CodePath with much help from the community. Contributed content licensed under cc-wiki with attribution required. You are free to remix and reuse, as long as you attribute and use a similar license. We need help from the broader community to improve these guides, add new topics and keep the topics up-to-date. See our contribution guidelines here and our topic issues list for great ways to help out. Check these same guides through our standalone viewer for a better browsing experience and an improved search. Follow us on twitter @codepath for access to more useful Android development resources. Interested in ramping up on Android quickly? (US Only) If you are an existing engineer with 2+ years of professional experience in software development and are serious about ramping up on Android quickly, be sure to apply for our free evening 8-week Android bootcamp. We've trained over a thousand engineers from top companies including Apple, Twitter, Airbnb, Uber, and many others leveraging this program. The course is taught by Android experts from the industry and is specifically designed for existing engineers. Not in the United States? Please fill out our application of interest form and we’ll notify you as classes become available in your area powered by local organizers.